June Bam-Hutchison leads on the National Institute of the Social Sciences and Humanities (NIHSS) catalytic pre-colonial historiography project for the NRF Chair. Her research interests are in Khoi identities and social justice, critical issues in heritage, school history education and in decolonial discourse and practice. With Christopher Saunders, she edits the peer-reviewed and accredited Bulletin of the National Library of South Africa. 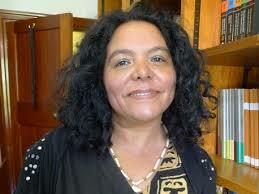 She lectures on the African Studies Master's degree programmes and the African Studies undergraduate Major. June Bam-Hutchison has held Research Fellowship positions with the Institute for the Public Understanding of the Past at York University (UK), Kingston University (UK) and in Archive and Public Culture (UCT). June also directs and lectures the 'Sites of Memory' course on Stanford University's overseas programme. She has served as Honorary Secretary for the African Studies Association of the UK from 2008 - 2010.